Chile is aiming to add about 2.2 GW of new solar power installations to its grid within the next 15 years, according to a newly released plan. In the 125-page report, the National Energy Commission (CNE) states that investment in solar energy in the northern electricity transmission system will be equivalent to the price of coal power (at US$2,500 per kW), and that in the central electricity system, solar will be only slightly more expensive. Of course, these prices don’t include the health and climate costs of coal, which, in a perfect world, they would. 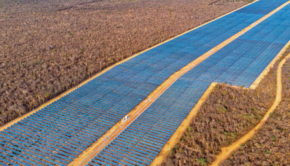 As the report states, the 100MW-scale Sol De Lua and Crucero 1 plants are due to come online in 2014, and be followed in 2015 by the 50MW Arica 1 and 100MW Crucero 2. Then, they will be followed by the Solar Sing 1 and Solar Sing 2 in 2026 and Solar Sing 3 in 2028, each of which will be 200 MW. Chile is continuing to move forward in its transition to becoming a clean energy giant in the region. Just earlier this month, it approved over 3.1 GW of new solar power projects. With the enormous solar power potential in the region, the country could easily receive all of its energy needs solely from solar power.